One of my #YesWeCrab goals was to write up this fall's storytimes that I never got around to posting. I normally like to write in more detail about the books and activities that I chose, but due to the delay in posting, you're just getting my bare bones outline. 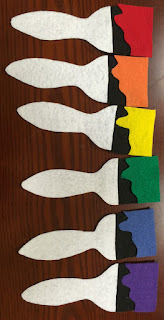 For this storytime, I was totally inspired by Anne's paint storytime at Anne's Library Life! Book: Little Blue and Little Yellow by Leo Lionni (HarperCollins, 1995). 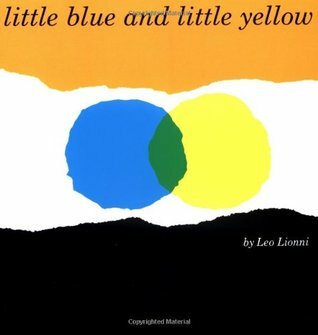 This classic is a great book to talk about color mixing. I put out the color paintbrushes and then had kids close their eyes and took one away. When they opened their eyes, I asked which color was missing. “I know the colors of the rainbow. Do you know them too? Book: I Ain't Gonna Paint No More by Karen Beaumont (HMH, 2005). 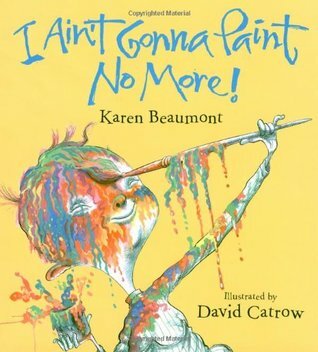 This is not only a fun book about a naughty kid taking advantage of paint, but it's a book that can be sung and a great book to ask kids to predict the next rhyme and practice those phonological awareness skills. Activity: Paint with Invisible Paint. Source: Mel's Desk. This was the perfect activity to pair with I Ain't Gonna Paint No More. I handed out (clean) paintbrushes and we painted with invisible paint. After we painted various body parts, we had to take a "bath" to clean off, just like in the book. 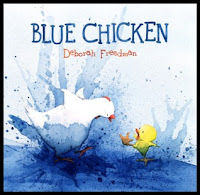 Book: Blue Chicken by Deborah Freedman (Viking Books for Young Readers, 2011). When chicken accidentally tips over the blue paint, it turns the whole farmyard blue! This book is kind of meta, making it a fun read for picture book enthusiasts. 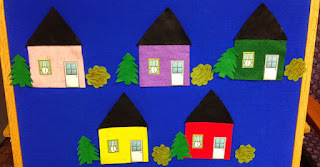 Felt: Mr. Pine's Purple House (based on the book by Leonard Kessler). When Mr. Pine can't tell his house from his neighbors' houses, he tries planting a bush and a tree but his neighbors like it so much that they imitate him and the houses look the same again! Finally, Mr. Pine has the idea to paint his house and ends up with a very colorful neighborhood. This is a great story to reinforce the concept of same and different. Closing Song: Do You Know What Time It Is? I was Very Brave this week and brought out our watercolor sets so we could make painting this week. It was a really fun activity and not nearly as messy as I feared. I made sure we had some spare mess shirts in case anyone wanted to wear them and I put out plenty of towels in case of water spills, but really they handled it very well!